One of the best things about moving abroad as an online poker player is meeting new people and especially those in the poker community. And this is really easy to do here in Thailand where there are probably more "poker expats" than anywhere on earth. One of those people who I have met is German small stakes grinder and pro Kieran "KieHa" Harding. He is also a former student of mine and a good friend now as well. He has quite the story of climbing up the ranks of online cash games in recent years and becoming a full-time pro with very impressive results in relatively tough NL50 and NL100 games. I thought I would invite him here on my blog to tell his story. Please tell us a bit about yourself and your travels. Hi my name is Kieran. I’m 30 years old and I’m from Germany. I have always loved travelling and being location independent is definitely one of the main reasons that I chose to play poker professionally. I was 20 years old when I first travelled to Thailand and I instantly fell in love with this country. I travelled all over the place for 3 months and it was just one big adventure. I’ve been back about 6 or 7 times since then and last year I finally decided that flying back and forth was too much of a hassle, so I just moved here! 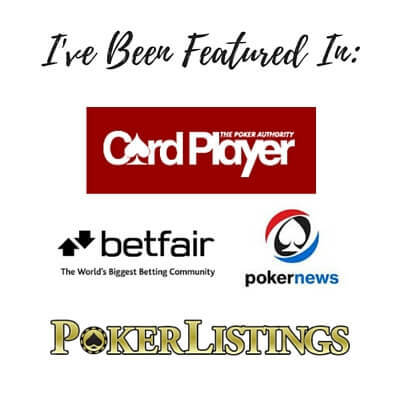 When did you first get introduced to online poker? I got introduced to poker around 10 years ago. I was on vacation in the Dominican Republic and it was pouring down the whole day. I had ESPN in my room and they were showing every episode of the WSOP 2005 Main Event [This was the year that Joe Hachem won it all for a cool 7.5 million dollars]. I had never even heard about No Limit Hold’Em before and I was instantly hooked by the complexity of the game and the amount of action. I literally watched the whole thing for about 8 hours straight and didn’t even want to leave the room to go to dinner. That was probably the first clue that I was going to become a poker addict. I didn’t actually start playing online until about 2 years later. 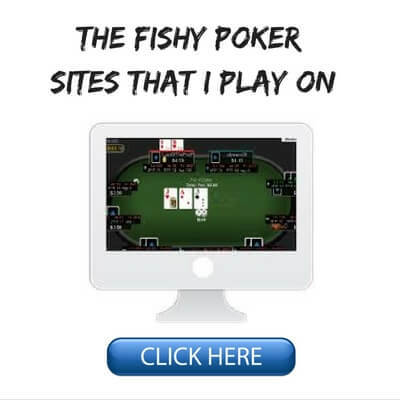 We started playing some home games with friends and I loved playing even more than watching poker but for some reason I didn’t sign up with any online poker room until later. What stakes did you start out at? Did you have success right away? No not at all lol. I actually struggled really hard with poker for the first 5 years or so. For some reason I kept going though (did I mention that I’m a poker addict?). Eventually I stopped messing around and started taking things more seriously. When I began playing online I think I deposited something like €20 on Pokerstars and jumped straight into the $7 Sit & Gos. I had no clue about bankroll management and played like a huge Nit, just waiting for premium hands and betting them when I hit something. I ran pretty good from the start and built my bankroll up to about $200. 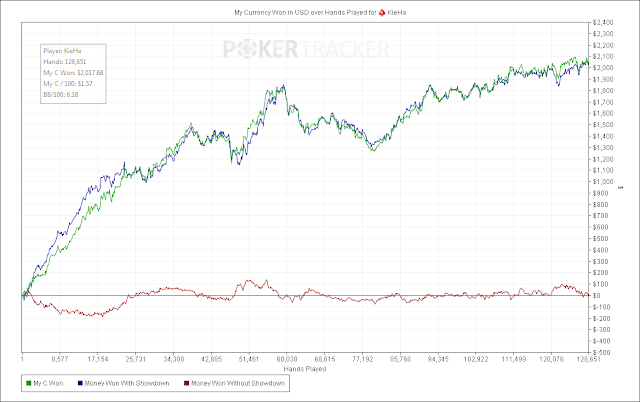 Then I started to play NL25 cash games and from that point I went broke a bunch of times. 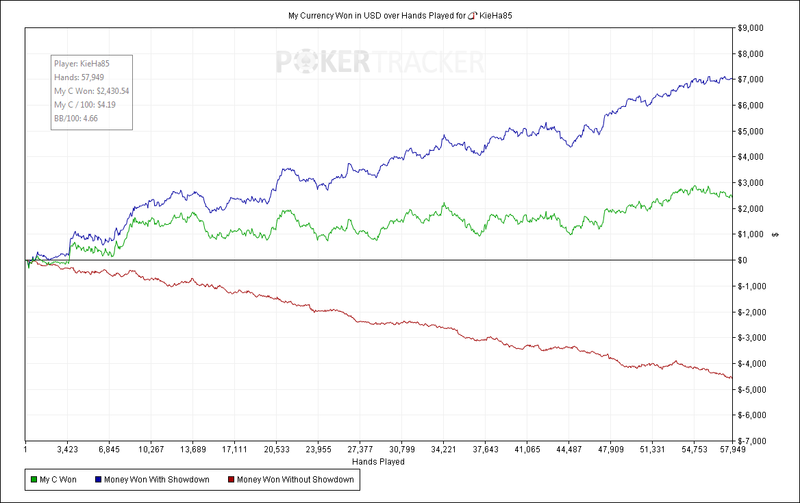 Who knew that playing with an 8 buy-in bankroll is not the formula for long term success in poker? I kept going like this for years. I would play solid poker and slowly build my roll but then any sort of downswing would send me on monkey tilt and eat up 30 – 50% of my bankroll. Finally I stumbled upon your book, Crushing the Microstakes, and things just clicked right away. 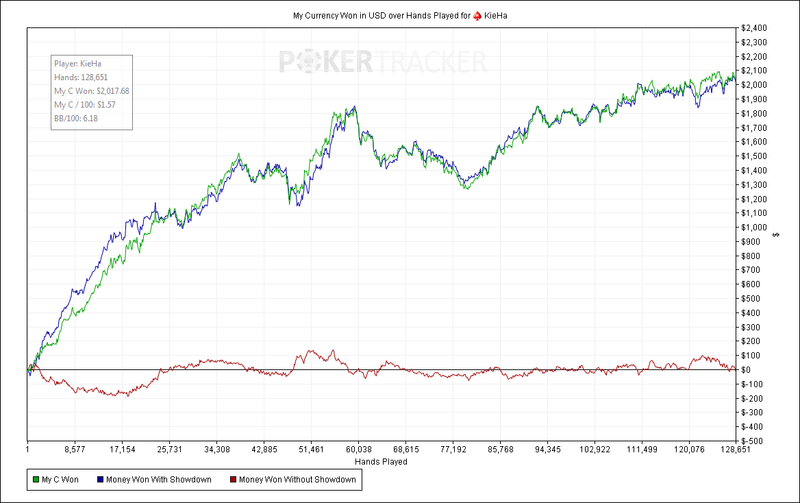 I dropped down to NL2 and slowly worked my way up the limits with at least 20 or 30 buy-ins for every level. What stakes do you play at now? What was the journey like for you to get to this point? Right now I’m playing mostly NL50 on Stars and NL100 on iPoker (6-max exclusively). Getting from NL2 to NL50 definitely took some time. 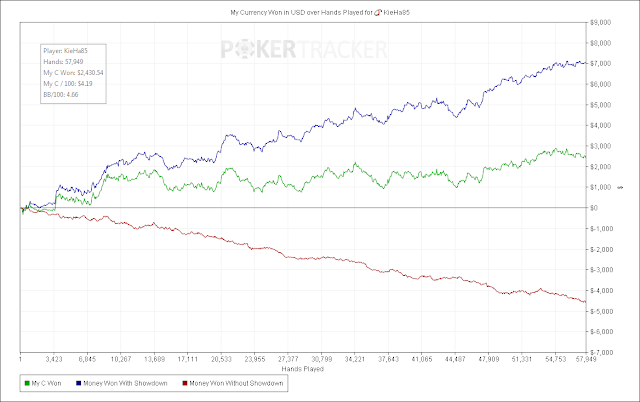 I would only move up when I had 30 buy-ins for the next level and move back down when I only had 20 left. There were a number of times when I moved back down after taking a shot which is definitely normal. I think for most people taking it slow and using conservative bankroll management is the only way that will lead to sustained success in this game. BR79: Here are Kieran's results (from his blog, linked below) for this year at NL25 and NL50 in the first graph and NL100 in the second one. What is it like living in Thailand and playing online poker? Life is good here. There are so many reasons that I love this country: the weather, the food, the beautiful nature and above all the people. Most people here work hard to get by and have a much harder life than people in Germany, yet they seem to be a lot happier in general. Thai people are incredibly friendly and good natured, especially the ones in the north like here in Chiang Mai. I am very happy here and I don’t see myself living anywhere else anytime soon. Playing poker for a living is definitely stressful at times. Dealing with downswings can be very tough, especially if they last for weeks or months at a time. Also just the day to day grind definitely takes its toll after a while. Grinding for 5+ hours a day is not easy, especially when you’re running bad. It’s definitely true what they say, poker really is the hardest way to make an easy living. All that being said though, poker can give you a kind of freedom that few other professions are able to offer. You can set your own time schedule. You don’t have to deal with bosses or co-workers. Even most internet jobs like drop shipping require interactions with suppliers and customers. In poker it’s just you and the game. Then of course there’s the big advantage of being a location independent digital nomad. You can do your job from (almost) anywhere that has an internet connection, and maybe a comfortable chair. And you can travel around and explore the world while you’re working. At the end of the day poker is also still a game and a very complex and mentally challenging one at that. I definitely still have a big passion for the game and most days when I wake up all I wanna do is just play poker all day! 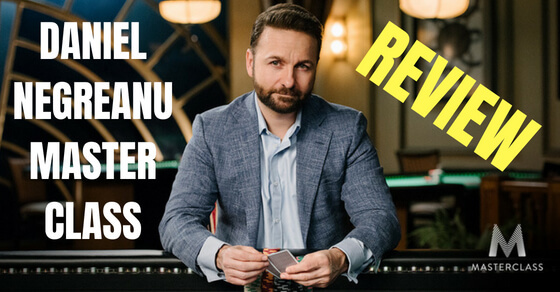 Do you have any advice for people who are just starting out in poker or struggling at the lower stakes? 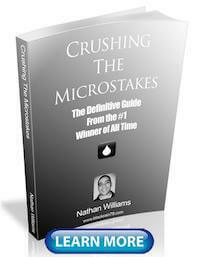 Read Crushing the Microstakes lol. Seriously though, if you have any trouble beating the lower stakes, then this book is definitely the best guide to set you on the right path. Other things I would recommend are just keeping things simple at first. 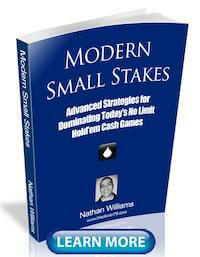 Play strong starting hands and bet them aggressively for value. Steal a lot from late position if it is folded to you. C-bet dry boards and give up on really wet ones unless you hit something. Just make sure you develop a strong fundamental game before you worry about more advanced concepts. Another important thing is to find games you can beat. Some players might argue that you only improve when playing against better players but I simply don’t agree with that. If you’re a losing player in a game it will create a lot of frustration and mess with your motivation to get better. Make sure you always have weaker players at your tables and that poker is fun. Everything is easier when you enjoy what you’re doing. Finally, don’t force yourself to play too many tables. I know it feels like a waste of time to only play 4 or 6 tables at NL2 because you can’t make any real money. That is not the point though. If you’re struggling at the micros your only job is to improve your game. Don’t worry about the money, that stuff will take care of itself if you focus on improving. Play an amount of tables that will allow you to think about your decisions and give you the opportunity to learn. If you exercise good bankroll management and make learning the game your priority then there should be no reason why you can’t move out of the micros and make a very decent side income or even turn poker into a career one day. I understand that you are coaching now as well? Can you tell us a bit about that? I recently started coaching others and I really enjoy it. Talking about the game I love and helping players improve is an incredibly rewarding experience. I remember how much coaching helped me when I was struggling so it’s nice to be able to help other players in the same way. I coach players at limits of NL25 and below, both 6-max and full ring. One method is doing a live Skype session where I will watch the student play and discuss the hands with them. Another method is going over some marked hands in their database (Pokertracker or Hold'em Manager) and analyzing their stats to find out what parts of their game need the most work. Lastly, students can also send me a video of themselves playing a session and I will record my thoughts on their play and send it back to them. I’m also available on Skype every day for questions from my students and I will do my best so that they get the maximum value out of our sessions. Do you have a blog or any social media where the readers can follow you and contact you? Yeah, I just launched my own blog at www.kiehapoker.com. 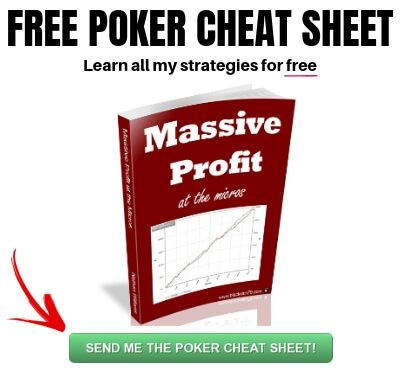 I will be writing about my life as a poker player in Thailand and posting strategy articles to help people improve. There is also more information about my coaching and I’ll keep posting updates on my results on a regular basis. 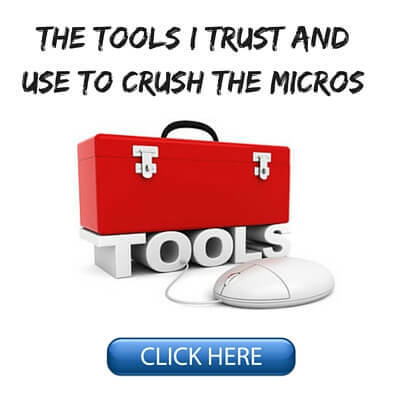 I want to thank Kieran for coming on my blog here to share his story and tips for moving up the stakes at the micros. I agree with basically everything he said above and I think his advice is spot on. I have seen his progression over the years and I have no doubt that he is probably a better poker player than me now anyways (although he won't admit it haha). If you have any questions for Kieran please leave them in the comments below. Also, I will be keeping an eye on his blog and when people ask me about coaching (I don't coach anymore), he is one of the people that I recommend. Once again, you can find out more about getting coaching from Kieran here. Lastly, let me know in the comments if you guys like seeing interviews like this one. I plan to do another one soon with a certain SuperNova Elite Sit & Go beast who I also met here in Thailand. That is, if he ever gets back to me with the answers to the questions...ahem! 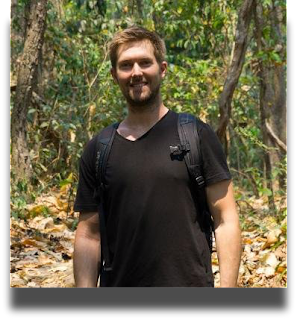 Glad you enjoyed this interview Taras! Yup, NL25 is a real stumbling block for many. It takes most people multiple attempts to beat it as Kieran admits was the case with him in this article. But once you get past it (like he has), then you can start making some decent money in this game. Thanks Taras! Yeah I would say NL25 is where things start to get "real". This is probably the first limit where you encounter any professional players who live in low-cost countries. So there's plenty of good regs around for sure. If you keep studying and improving you'll find that everyone there has pretty big leaks that you can exploit. 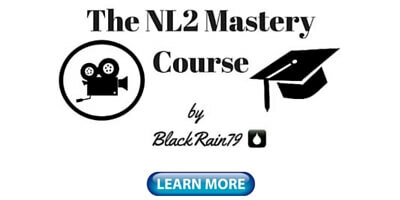 Once you beat NL25 you can start making some good money in this game. Thanks for the feedback. I will try and get some more of these in the future! Haha, I have met plenty of German poker players and they are usually pretty good! My name is Luiz and I'm from Brazil. I read your first book and it really helped me a lot, was one of the first poker books i've readed, when I get free time I will read the second. So I have no questions for now, just wanna say thank you. Thank you very much Luiz. I am glad that CTM helped you! Yes please most definitely more interview type articles. I must agree with your interviewee that your books definitely improved my play even if I am a HUDless chicken. Thanks for the feedback Martin. I will do more of these interviews in the future. I am glad that my books helped as well! Nice interview Nathan hope to see more of them soon. Definitely agree with what he says, last month I took two unsuccessful shots at NL25 but not planning on giving up. Sadly I had a bad run on NL10 as well but I'm building myself back up to continue taking shots until I finally stay there. What stakes are you currently playing? Are you planning on releasing new content on DragTheBar or your YouTube page? Take care and best of lucks to you! I am glad that you enjoyed this interview! Sorry to hear about your unsuccessful move up attempts. I have been there many times. Just keep doing what has brought you success thus far and eventually you will stick. You can also use the hand histories that you have from NL25 to see if there is anything that you could be doing better against the regs there. I have been playing at NL2 and NL5 mostly of late because I am probably going to make a video series at these stakes soon. I will make more Youtube videos hopefully soon. DragTheBar, I can't say for sure. According to the grapghs the volume seems low. Only about 50k hands per month. Hows that compare to the other pros at similar stakes? Kieran can probably answer this better but I would say that 50k hands a month is very typical these days for somebody who table selects and beats the games for a solid win-rate like he does. You can't mass table in today's games at stakes like this and expect to crush. Yeah my volume is probably lower than that of most pros. I simply don't like to play more than 6 tables at once. When I do I tend to rush decisions and I don't think about ranges as deeply as I should. Playing 4-6 tables allows me to pay attention to everything that's going on and think about every decision carefully instead of just auto-piloting. That way I don't just achieve higher win rates but also a much higher rate of improving my game. I'll probably never be a baller who makes 10k a month from poker but I make enough to live a pretty good life here in Thailand. If you are getting bored at the tables it might be a good idea to simply add another table. This will keep you more busy and prevent you from playing poor hands due to boredom. Please, more interviews. This one was great! Glad you liked it. I have several more interviews already planned. There will be a new one in a few days.